Dec. 9, 2013, 12:03 p.m.
By Caroline O’Donovan @ceodonovan Dec. 9, 2013, 12:03 p.m. When the Curbed network of websites — local outlets focused on dining, real estate, and fashion — was bought by Vox Media last month for around $20 or $30 million, Digiday’s Josh Sternberg asked founder Lockhart Steele how a media company so laser-focused on local could grow to be a company of that value when, as we all know (or think we know), local doesn’t pay. Building a scalable media business that generates revenue through local advertising has proven a challenge — just ask Patch. But there are still believers, like Scott Brodbeck. Brodbeck is a local news publisher in suburban Virginia. At a recent conference on hyperlocal marketing, Brodbeck discussed how he had turned hyperlocal news site ARLnow into a profitable business, allowing him to launch Reston Now, his third local news site, in October. There are, of course, quite a few independent local online publishers who’ve been able to build sustainable for-profit businesses covering a community — The Batavian, Berkeleyside, West Seattle Blog, and more. The membership list of LION (Local Independent Online News Publishers) includes more. But for the most part, those success stories have remained focused on a single community. Brodbeck wants to expand across the region. Brodbeck, in the beginning, didn’t want to be the guy going to city council meetings, either. He got his start in journalism working for local TV stations in the D.C. area, and says chasing fires was more his thing — but he quit when he felt the stations weren’t pursuing digital enough. He started Arlington Now in his apartment, focusing on providing news that would be useful to his upper-middle-class suburban neighbors. The next step was finding local advertisers. The site now turns a profit, enough to lead him to expand his project, first to Bethesda and then to Reston, where he’s hired as editor Karen Goff — somewhat ironically, a former Patch employee. When someone writes a comprehensive history of local online news, northern Virginia will play a significant role. As is also true in suburban New Jersey, another early hyperlocal hotbed, the demographics of the D.C. suburbs has made them alluring to those trying to build businesses. Old-timers will remember The Washington Post’s LoudounExtra, which the paper launched in 2007 but ultimately deemed unsustainable after a mere two years. And the late TBD.com was also trying to cover local-level news at a metro-level scale. Sponsored isn’t the majority of Brodbeck’s ad revenue, but the payoff — beyond finding houses for his friends — has been clear. Reston Now is already featuring this type of advertising as well, a frequent sponsored real estate column. For Brodbeck, being a local publisher is about pragmatism. If you provide useful content, people will want to read it, and if people are reading it, you’ll be able, with a little patience, to find advertisers who want to reach those people. Considering that Reston Now already has almost 5,000 Facebook followers, it seems like he’s on to something. I asked Brodbeck who he thought had the right idea in the local space, and he mentioned a few local news sites in the Nashville area. POSTED Dec. 9, 2013, 12:03 p.m.
O'Donovan, Caroline. "In suburban D.C., a network of hyperlocal news sites expands and bets on local advertising." Nieman Journalism Lab. Nieman Foundation for Journalism at Harvard, 9 Dec. 2013. Web. 19 Apr. 2019. O'Donovan, Caroline. 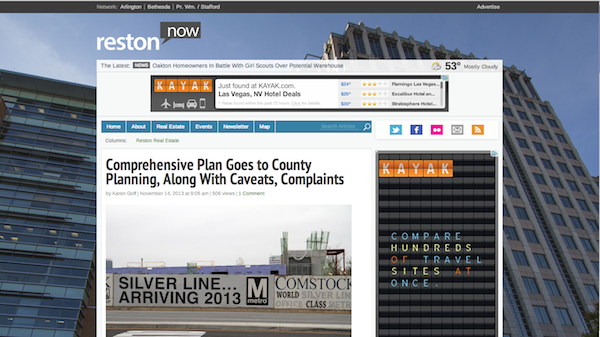 "In suburban D.C., a network of hyperlocal news sites expands and bets on local advertising." Nieman Journalism Lab. Last modified December 9, 2013. Accessed April 19, 2019. https://www.niemanlab.org/2013/12/in-suburban-d-c-a-network-of-hyperlocal-news-sites-expands-and-bets-on-local-advertising/.